TotalMSK is a provider of Corporate Wellness, on-site, pop-up clinics, throughout Berkshire, Buckinghamshire, Cambridgeshire, Hampshire and Oxfordshire. TotalMSK also offers a mobile Private Patient Clinic Service specialising in the treatment of work and sports related musculoskeletal conditions. The private patient mobile service operates up to 20 miles from Cambridge and Reading, with patients being seen in the comfort of their home or place of work. The knee joint complex is notably one of the most complicated joints structures within the body, with the shoulder joint complex arguably being the most complexed. Knee joints consist of multiple components including, bone, ligaments, tendons, bursae, articular cartilage, menisci, synovial fluid and fascia. Furthermore, there are many muscles with attachments via tendons, which pass over the knee joint complex and are an integral part of overall structure and function. Each of these structures of the knee provides different and in some cases multiple functions. Some typical examples of differing roles include shock absorption (menisci, cartilage), friction reduction (bursae, cartilage), structural stability (ligaments, tendons, muscles, fascia), physical movement (muscles) etc. Furthermore, many of the functions of specific structures are affected by the other structures, for example, muscle function can be changed by the state of the fascia. The knee joint is a load-bearing structure and within the “Kinetic Chain”. The “Kinetic Chain” includes; Ankle joints, knee joints, hip joints, lumbar spine, thoracic spine and cervical spine. In essence, if the structure changes in one area of the kinetic chain, due to injury etc. then this alters the function of said structure at that given level. Each part of the kinetic chain can impact other areas further up or lower down the chain, and this can have a cumulative effect. The knee joint itself has a relatively limited range of motion, flexion (bending the knee), extension (straightening the leg/knee) and limited internal and external rotation (similar to when one turns the foot inwards or outwards). Patellofemoral Syndrome tends to affect people who perform activities which involve a lot of repetitive knee bending activities. Motions such as squatting, running, jumping and even stair climbing can typically aggravate symptoms and also cause them in the first place. Hence, it is no surprise that Patellofemoral Syndrome is more common to certain types of sporting activities such as running (runners knee), rowing (rowers knee) and basketball (jumpers knee, though frequently this is more a case of Patella Tendinopathy). Patellofemoral Syndrome pain tends to manifest as anterior knee pain and more specifically behind the lower portion of the patella or kneecap. Symptoms typically feel worse after prolonged sitting with the knee fully flexed (as at the cinema), during activities that involve bending the knee (running, stair climbing, rowing, jumping). One may also notice crepitus (creaking or clicking type sounds) within the knee joint complex when moving from sitting to standing and vice versa. Patellofemoral pain is thought to occur due to an irritation of soft tissue structures around the patella, due to changed mechanics and or muscle imbalances within the kinetic chain. Such changes then affect how the patella moves and many knee-bending activities involve repetitive patella movements, either under standard load or additional weight-bearing load. In order, to understand Patellofemoral Syndrome in more detail, it is useful to see the anatomy of the Patella and how the Patella interacts (tracks) with the Femur. The inferior aspect or lower portion of the Patella (apex) is attached to the superior or upper portion of the lower leg (Tibia), via the Patella Tendon. 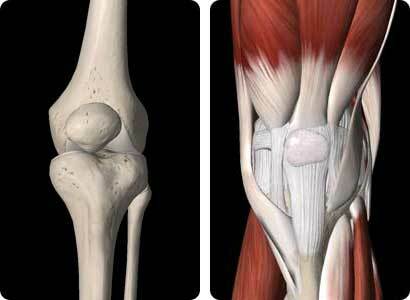 The upper part of the Patella (base) is attached to multiple muscles (quads) via tendons. The diagram below, shows the posterior (back) of the Patella and that there is a “V” type shaped ridge in the middle. The posterior portion of the patella also has a covering of hyaline cartilage. Hyaline cartilage is a hard material, which covers areas of bone which have contact with other areas of bone. Joints with healthy hyaline cartilage slide very easily across each other with very little friction. The inferior portion or lower part of the Femur has a small “V” shaped notch (intercondylar notch, patellofemoral groove), as can be seen from the diagram below. The end of Femur also has a covering of hyaline cartilage, which comes into contact with the back of the patella and lower leg (tibia). The “V” shaped protrusion on the posterior side of the Patella fits neatly and slides over the “V” shaped notch on the Femur during knee flexion (bending) and extension (leg straightening) motions (patella tracking). Changes in the mechanics of the normal patella sliding motion can result in irritation to soft tissue structures in and around the Patella. 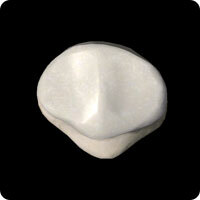 In some cases, the articular cartilage surface on the posterior portion of the Patella can become damaged too. Furthermore, changes affecting the Patella and knee joint function can affect other areas in the “Kinetic Chain”. Equally, other areas within the “Kinetic Chain” can be the cause of the Patellofemoral Syndrome symptoms. Muscle tension within the quadriceps does affect the level of pressure applied to the Patella during knee movements, though the tension may be the symptom and not the cause. The following two diagrams show the knee joint connective tissue and the knee joint with all structures visible. Furthermore, there are a large number of possible knee injuries with similar, and yet often subtle differences. Self-diagnosis with “Dr Google” has a tendency not to end well, and so please be warned. It is better to seek advice sooner rather than later from a suitably qualified professional. Just masking symptoms with painkillers and letting symptoms get worse tends to lead to longer recovery times. As with many conditions with an inflammatory component, it is often wise to take action sooner rather than later and following simple (R.I.C.E.) guidelines is a good start, Rest, Ice, Compression, Elevation. However, R.I.C.E. alone is not likely to identify the actual cause of the problem and equally topical or oral anti-inflammatories are not going to address the cause either. Self-massage foam rollers and self-trigger point therapy (TPT) can both prove useful, though one needs to identify the source of the pain. Seeking advice and treatment from a suitably qualified professional tends to be the best way to identify and treat the cause of the problem. Based on personal treatment experience, a combination of McTimoney Chiropractic and Sports of Remedial Massage (soft tissue therapy) has proved very useful. Although Chiropractic can and does affect soft tissues, there are limits. However, the McTimoney Chiropractic technique is very good at addressing “structural” aspects affecting the kinetic chain and patella tracking. Sports Massage and advanced Remedial Massage can then effectively be used to treat the effected dysfunctional muscles and thus “function” of the joint structures within the “kinetic chain”. That said, there have been occasions where Dry Needling and even IASTM type techniques have been needed to address acute and or chronic soft tissue changes. The next Running Related Article will cover Iliotibial Band Syndrome (ITBS) / Runner’s Knee. Article written by Dr Terry Davis MChiro, DC, B.Sc (Hons), Adv. Dip. Rem. Massag., Cert. WHS. All of these types of health and well-being are interrelated, and the relationships are far from being fully understood. "Stressors" can take many forms and effect each type of health and thus overall health. Research has demonstrated significant links between various aspects of health. Hence, a pure BioPsychoSocial model of health is a little too simplified. Achilles Tendinopathy is a condition that can be very painful, severely hamper ones running ability and can often prove problematic to resolve once Chronic. The injury is typically characterised by pain, swelling and general stiffness just above the heel bone (1 - 2 inches). As with many conditions with an inflammatory component, symptoms are usually worst first thing in the morning and appear to improve with movement. Hence, it is quite common for people to push through the discomfort and or even run through the pain. However, the tissues then usually feel far more painful after the activity, and the pain, stiffness and swelling come back after rest or a nights sleep.